Among the oldest stories from the Greybull River country of Northwest Wyoming, is the legend of the battle of Papy-Po Butte. The story was probably told to some of the first white inhabitants of the Greybull River country by mountain Crow Indians, who had lived and hunted in the region for unknown generations. The legend tells of one tribal group being attacked by the war party of an enemy tribe. 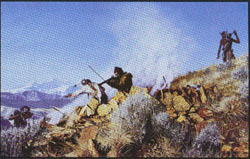 The Indians trapped on top of the butte were in a desperate position, as they were surrounded by an overwhelming number of enemy warriors. Eventually, all those who made their stand on Papy-Po Butte were either killed or captured, though tribal members showed great courage in fighting to the last. In 1978, the first two inscribed sandstone slabs were found on top of the butte; inscribed in English, they testify to the Indian dead. The questions remains, "Who was this white man who probably shed some tears and maybe some blood on Papy-Po Butte in 1811? The silent hills hold their secrets well. Exclusive issue of only 250 signed and numbered artist's prints at $250.00 each. Image size - 16" X 24".